After School Activities for Kids: Do Children Do Too Much? After school activities like karate can help kids make friends, build confidence, and improve fitness. As long as a balance is kept with their free time. 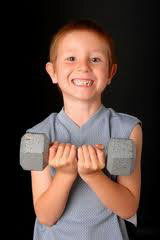 After school activities promote social skills, education, or physical fitness. They are usually great for kids. A sense of personal accomplishment can be achieved when a child masters a skill such as making it to the next belt level in karate. It is far better than having your kids go home and sit in front of a TV or playing video games. But how much is too much? Every day in my karate schools I see it; the rush and hustle of parents and their kids trying to get from one actitity to another as they have booked martial arts and soccer practice (or some other sport) on the same day. I see the short tempers, frayed nerves, and sometimes lack of focus among the kids. Are your kids trying to do too much? How do you know? What can you do to prevent it? At the extreme I have read stories about children starting sport as soon as they were old enough. They practised and played hard all the way through high school, where sport became very serious. For some, by high school they had already burned out their arms or knees as well as any chance of going professional or even getting a scholarship. Or they may be mentally burned out and have no desire to ever play the game again. How do you know if your child is trying to do too many after school activities? Their grades begin to suffer. You notice they have very little time for homework. Their teacher comments that they seem tired in class and are unable to get their work done. This is especially true for older kids, as the homework levels increase as kids enter high school. Your child is not enjoying the activity anymore. It is becoming too much like a “job” or “chore”. They just seem uninterested and have no desire to practice. They do not look forward to their classes. They are always tired. When they get home from the after-school activity, they just plop down on the couch and sleep. They are too tired for homework or even video games. They may become short-tempered from lack of rest. After school activities become the kids playtime and their only friends are their team mates. They have no time for a social life. This is a sign that they are lacking free time. The child seems very stressed out. Some children become ill. Others may become withdrawn and nervous while others show anger and demand attention. Adults are not the only ones who become stressed. Watch for the signs. You find yourself very stressed out at the end of each week trying to play assistant coach, chauffeur, and chief motivator, especially if you have multiple children in different activities. However, each child’s personality and situation differ. There are some children that need to stay active. One of my student’s mothers told me “My son is very highly strung and needs to be doing something most of the time to stay out of trouble”. We all know a few kids that need something to do rather than just watch TV or hang out at malls. But be careful you are not signing your kids up for activities just to keep them entertained. If they are taking on too much, what can you do about it? Make sure they have a couple of free days each week. Some of the parents that come to our karate classes have told me they limit the number of activities their children do in any given school term. One or two after-school activities is a good rule of thumb. They set this limit and they stick to it. This will give their children more time to relax and catch up on any homework. It seems like a reasonable approach. Others have set aside one evening a week where no one can plan anything — that is their family night where they play games together or watch a movie. Others make sure that their family eats together at least four or five nights a week. This is a great time for kids and parents to bond. Let your children pick their own after school activity. They will be more likely to enjoy it and stick with it. Making your child participate in an activity they don’t want to do, or don’t have the talent for is not right. Watch, listen and talk to your kids and they’ll tell you what they want and what they like. You’ll know if your child is athletic or more interested in arts or music. Don’t be afraid to let your children experience things and learn what they like. It’s okay to tell your children that once they sign up for the activity, they are committed to participate to the end of the class or season. This teaches kids to follow through and encourages both parents and kids to be especially selective when choosing an activity. Help them set their priorities. Your children need your help to understand how to prioritize their activities. Explain that if they spend a certain amount of time on one activity it means less time for doing things that they also think are important. Some kids may feel that you are punishing them by limiting their after-school activities. You will need to explain the benefits of having less stress and more free time. Kids should be enjoying life rather than being in a constant state of activity. Structured activities are important, but if kids are over-scheduled they lose out on the unstructured free play that they need to develop problem solving and learn social interaction. Kids need a chance to breathe, be themselves, daydream, and play. They need to learn to entertain themselves and enjoy their own company. Parents need to strike a balance that includes both. Remember the big picture–they’ll be grown-ups soon enough. What are your experiences with after school activities for kids? Do you feel your children do too much? The kids will be nervous in their first martial arts class, but will soon be smiling, as they discover how much fun it is. Welcome to your child’s first martial arts class. As the sensei, or teacher, it is my job to make you and your child feel welcome. Our purpose is to pass on our knowledge and passion for the art we teach. Relax and have fun. Here are some of the things to expect and how to prepare for it. Please be there to support your child. This is really important as most children will be very nervous in their first class. It is completely natural to be a bit scared—everyone is on their first day, but you’ll soon see there is nothing to be afraid of. The sensei will see to it that your child is made to feel welcome, and will do everything in his or her power to make sure your child has a positive experience on their first day. 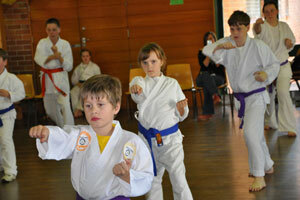 The sensei will introduce himself or herself to you and your child upon arrival. Try to get there early and find a seat. Most good schools will allow parents to watch the classes. Locate the nearest toilet so you can find it when you need it. Try to have your child use it before class, so they don’t miss anything important in class. Make sure your child checks with the sensei if they have to leave class. Bathroom emergencies are the exception. When you arrive, if the other children are running around and playing, let your child join in, unless there is a class in session. This is how children relax and make friends. A professionally-run school will have information for you to read about their program. Ask the person at the front desk for a copy. Have your child wear loose-fitting clothing and comfortable shoes. Uniforms (gi’s) will be available for sale, but try a few classes first to see if this martial arts school is right for you. Once you have purchased a gi, learn how to tie your child’s belt—it is not the sensei’s responsibility to tie the students belts. Bring a water bottle as there will be drink breaks. Most schools do not allow food and drink in the training hall, except for water. Bring a small towel—A good class will get you sweating a little and you will be expected to clean up your own mess if you make one. What Happens in the First Martial Arts Class? Bowing in and what it means will be talked about. Included in this discussion will be the importance of respect for others, when to use martial arts, and some of the history of their organisation. There might be some discussion of the rules of the training hall; such as no talking during class, hands to yourself, and listening when the sensei is talking. These rules are for the benefit of everyone. Warm-up. 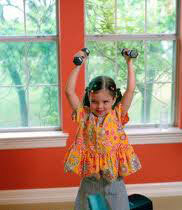 Your child will learn the stretches that are done at the start of classes. The stretches are very important as they will prepare your child’s body for the fast, snappy moves of martial arts. This prevents injury and ensures that the student is flexible enough to perform the movements. Stances. Your child will learn the basic stances, such as the horse stance and sparring stance. The names of the stances might vary from school to school. The stances are the building blocks of martial arts, and are very important, as a proper stance ensures good balance, power, and mobility. Moves. You can expect some blocking moves or a limited amount of punches or kicks to be taught on the first day. Some schools will break up the class and take the beginners into a smaller group where they can work at their own pace. If the whole class is a beginner’s class, they will probably all stay together. Sparring. There should be no contact between students at this stage. Beginners should not be sparring (or pretend fighting), as they lack the control and technique of the more advanced students. Sparring, in a well-controlled and safe environment , will be done at a later time. This is the best time to ask the sensei any questions you or your child might have about the class or program. Don’t be afraid. A good sensei is there to help you and your child achieve success in the martial arts. If your child is excited about the class and wants to return, you have found the right school. If not, you may want to look around a bit more. 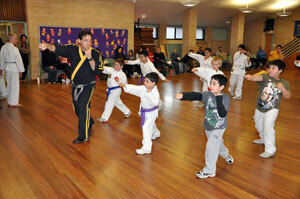 Read this post I have written on how to find a good martial arts school for your kids. Try to practice the techniques shown in the first class before the next class. This will help your child improve faster and will make them more confident in later classes. Do not worry if the moves seemed a bit difficult on the first day. Everyone, black belts included, were once white belts. We all felt uncoordinated, awkward, and uncomfortable when we first started. The sensei is patient and will offer encouragement to your child. 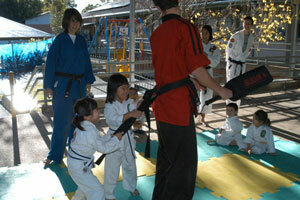 In a very short time, your child will gain the confidence to achieve their first belt on this marvellous journey. Does anyone out there remember their first day of training in the martial arts? Your comments are always appreciated. Karate for Kids: Is it Safe? 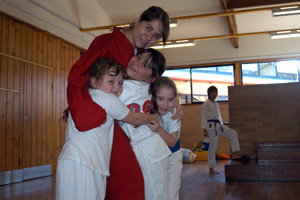 A good karate instructor that cares about kids will see that they are safe. 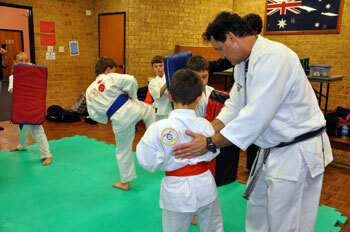 Are you concerned for your son’s safety but too scared to allow him to try karate because you fear he will be injured? Do you resist your daughter’s attempts to join her friends in the local martial arts classes because you think her face will be permanently disfigured by a kick or punch? 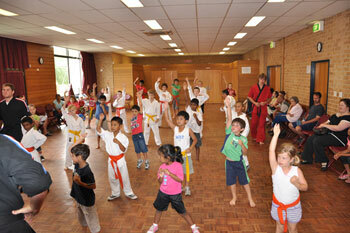 Relax, karate and most other martial arts are relatively safe, especially for kids. Statistics http://www.nyssf.org/statistics1998.html show that martial arts are safer than most other sports, especially in the younger age brackets. Young children have less power, and are therefore less able to hurt each other than adults. As you can see from the above link, martial arts are safer than baseball and basketball, and far safer than football (gridiron) or rugby. In addition, the nature of injuries are usually far less severe in martial arts, with the typical injury a sprain, strain, or bruise, as this article shows. These are minor compared to the brain and spinal cord injuries that happen in more dangerous sports. Nevertheless, injuries do occur. Luckily, there are things you can do as a parent that will tip the odds in favour of your child’s safety. First, schools that specialise in children are your best bet because they usually make sure the classes are kid-friendly, meaning non-intimidating and safe. Remember, they are teaching kids, not prison guards or army combat types, where the outcome is life or death. Always insist on watching your child’s classes. Good martial arts schools will allow and even encourage you to watch the classes. It is the parent’s right to see what is going on. It is also the parent’s right to question something that does not look safe. Are the classes usually preceded by a warm-up session? Flexibility training is the key to injury prevention. Kids are usually far more limber than adults so the warm-up session does not need to be as long as in the adults classes. Sparring and contact is the most critical area as this is where the potential for injury is greatest. Sparring is not for beginners, especially when they are kids. The student needs to develop not only correct technique, but also the control that goes along with it before he or she steps into the sparring ring. Does the school require students to wear protective gear, including head gear, gloves, mouthguards, shin/foot pads? Is the sparring overseen by black belts, with the sensei always present? Are there clear-cut rules for which areas of the body are off-limits as targets? Some contact is not necessarily a bad thing, as it teaches children the importance of covering up and using footwork to evade their attacker. But allowing children to punch each other in the face or neck is a big mistake, as is kicking below the belt or in the back. 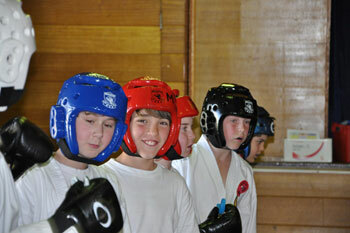 Full-contact sparring should be for students 16 years and older, not for young children. Are students that show a lack of control cautioned, or is the instructor creating an aggro environment, where the kids are encouraged to be aggressive? Technique and control should be emphasised in sparring, not brute power. These are all important areas to consider when viewing a sparring class. Weapons can be dangerous, especially ones that are difficult to control like the kamas or nunchucks. It is advisable to require students to be a certain level, preferably black belt, before they can begin learning them. Overall, get a feel for the instructors, as their attitudes will be reflected in their students. If they are caring and respectful, they will produce caring and respectful students in a safe, friendly environment, where learning is fun and everyone is welcome. Get yourself ready for the grading by sparring as many rounds as possible--this will get you fit. 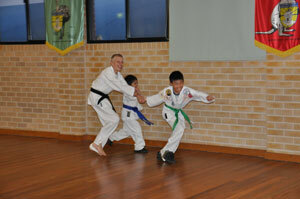 Kids–how do you pass your upcoming karate grading? Follow the dozen steps below and you will be on your way to your next rank. Ask the Sensei what will be on the grading. Many instructors will give you a handout that includes all the techniques on the actual grading–just ask for it. Some instructors will even let your parents video or photograph the techniques required. Take the list home and mark the techniques in which you are not 100% sure; next class ask the sensei how to do them. Once you have all the techniques down, have someone call them out one after the other. Now try to do it faster. Then do it in random order. By doing this, you are preparing yourself for the stress of the actual test, and you will know each technique by sound. The forms or kata will take the most practice since they are the most difficult. Do them facing all directions and then do them with your eyes closed. Pay particular attention to the stances as that is what the sensei will look for. Do each form with intensity (imagine attackers coming at you), even while practicing. Go to class early (or stay late) and ask one of the black belts to take you through a practice grading. Most will be willing to do this. The sensei will notice your initiative. If your kids karate grading involves sparring, get yourself fit for it. Run, bicycle, hit the bags, anything to build up your heart and lungs. Do as many rounds of sparring as possible, even if it is only against a moving kick bag. Get there early to warm up and stretch. This will help you get those kicks up and prevent injury. You do not want to pull a muscle on grading day. Even though most kids are naturally flexible, don’t take a chance. Perform your techniques with full power. It is amazing how many people do not do this. Spirit is really important. Yell your kiai each time you do a technique. Pop back into position so you are ready for the next move. Do not let your classmates throw you off with their mistakes. Keep a razor-sharp focus on your imaginary opponent, right in front of you. Other kids may try to talk to you during the grading. Ignore them. You will make mistakes, it is human nature and no one is perfect. Do not let it get you down. Improve on the remainder of the test and you will still have a good shot. Pass or not, always ask the sensei how you can improve. This will help you next time you grade. It also shows the sensei that you care enough to ask. Kids Karate Grading: How to Pass is an original article from Sensei Matt Klein. 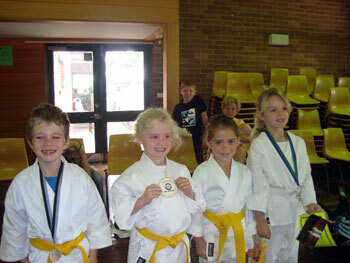 For more information check our kids karate classes in Sydney link. Note: After this article was written, an excellent post at My Journey to Black Belt was written. In it Sue referred to many of the principles in this post. Thank you Sue.